1. Mount the buffing wheel on polishing head arbor, chuck adapter, work arbor or motor shaft. Buffs should be sufficiently tightened to prevent slippage on shaft when in operation.using proper size flanges and tighten to prevent wheel slippage. 2. Apply compound sparingly to the spinning wheel face. Repeat compound application as needed. Do not press too hard or overheat the work surface. Let the wheel and the compound do the work. 3. Buff below the center line of the wheel in a downward direction. 4. Before changing from one compound to another, “rake” the buff with a buffing wheel rake to remove any existing compound. 5. Once the article has been buffed, whiting powder may be used to examine finish. It may be washed with warm soapy water to remove excess buffing compound or dirt which may have accumulated. 6. The finish obtained can be preserved from tarnishing or dulling by applying a clear transparent paint lacquer finish. Profound differences in surface characteristics can be affected simply by varying the binder of the compound. The same compound made with less binder will make a drier-working compound with less cut and probably leave a higher luster. Increasing the binder ratio will result in a greasier grade that in most instances will cut sharper, provide more lubrication, and possibly reduce the frequency of application. Too much grease, of course, may serve up its own problems and be more difficult to clean, leaving the work somewhat smeary and harder for the operator to determine if the surface has been properly buffed. Review the type of buffing wheels being used and determine if they are correct for the job involved. Too hard a buff can result in a poor buffed surface, either having missed surface entirely because of the hard density or perhaps having cut too aggressively, consequently leaving a work surface with a streaked or cloudy appearance. Too hard a buff may also cut through high spots on plated work or create a wavy surface especially on the softer metals. Conversely, too soft a buff may not permit the cutting particles in the buffing compound to actually come in direct contact with the work surface. In effect, too soft a buff will mush too deeply, turning the ply over at the face so that a skidding or sliding action is actually taking place. Is the peripheral speed fairly correct for the job in involved? Simple experiments can be run by altering the diameter of the buff or changing the spindle speed. 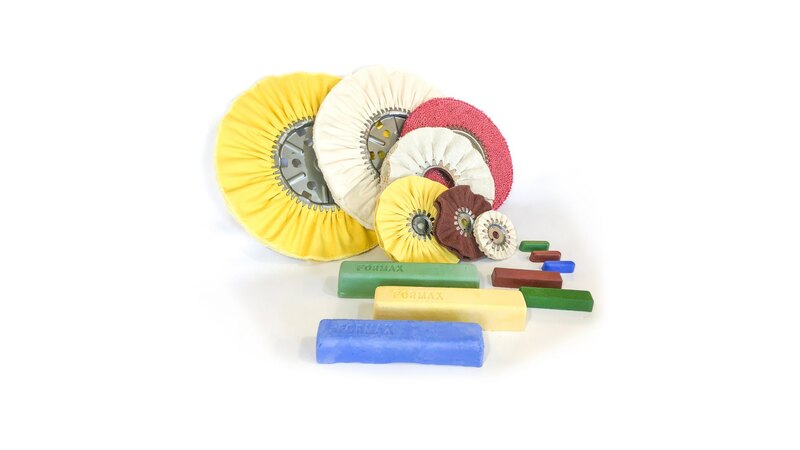 It can be said as a general statement, “most buffing wheels are run too fast.” Centrifugal forces created by high speeds harden up the buff, sometimes excessively, making it difficult to retain a good cutting head of buffing compound. Too high a peripheral speed creates other problems such as excessive heat on the periphery of the buff face, as well as within the internal construction of the buff, itself. These two factors may lead to buffing wheels breaking out into fires, or at the very least, down-grade the tensile strength of the cotton as to permit excessive buff usage. Made With Only The Finest Ingredients!